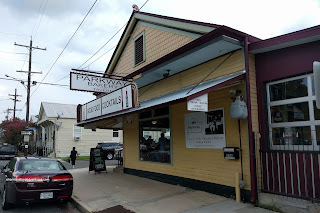 After a delicious and overstuffed oyster po' boy at Mahony's, we were left wanting more. Although there are many choices for po' boys in New Orleans, we had to narrow it down to 2 places since we were only in Nola for 5 days. Yes, I realize Mijune ate like every po' boy she could find while she was there IN ONE DAY, but I'm no Mijune. Hence, Viv and I decided to hit up one of the more popular and oldest spots in Parkway Bakery & Tavern. We ended up taking Uber after days of walking and walking (and taking the streetcar, which was fun). 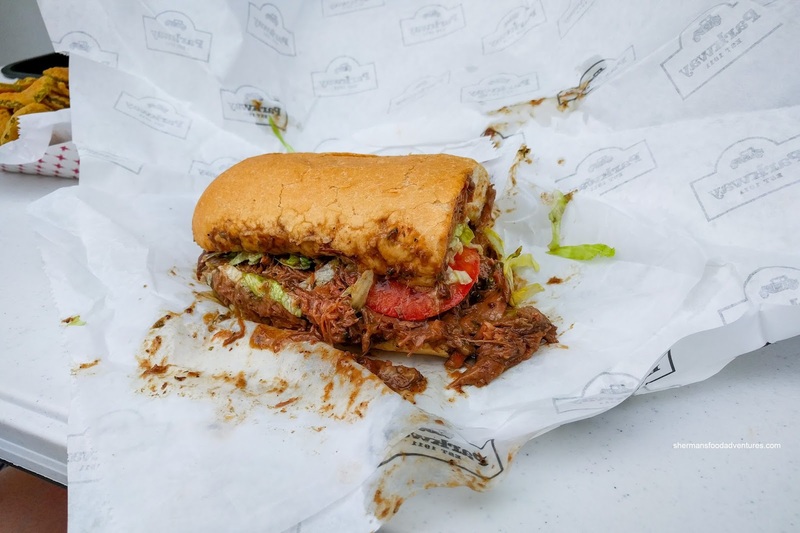 Since we were not there on a Monday nor Wednesday, there was no oyster po' boy. 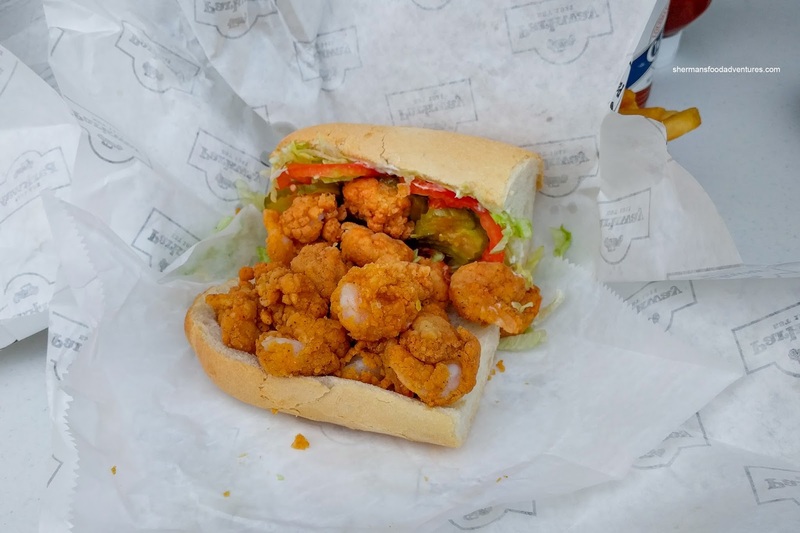 No matter, we decided to go for one of their most popular in the Shrimp Po' Boy dressed. They weren't shy in stuffing this thing full of perfectly fried shrimp. These were large, buttery and exhibited a cold-water snap. The breading on the outside was not as heavy as it looked and was crispy and easy on the grease. There was more than enough flavor to eat on its own, but a bit of hot sauce really livened it up. I enjoyed the roll more here at Parkway than Mahony's since it was easier to get through. Furthermore, the mix of mayo and lettuce did not fall out as easily as the one at Mahony's. Viv went for the other popular sandwich here in the Roast Beef Po' Boy dressed. Didn't matter how we tried to eat it, because everything just kinda squirted out. There was so much roast beef in this thing, it became something we needed to eat with a fork. The shredded beef had the consistency of a pot roast where it was tender and almost melted in our mouths without any chewing. It was bathed in a rich and flavorful gravy that was just salty enough. Loved the contrast between the soft and saucy beef with the light and crusty roll. Although everything came out, the roll itself stayed together and did not disintegrate. For our sides, we had the Fries and Deep Fried Pickles. 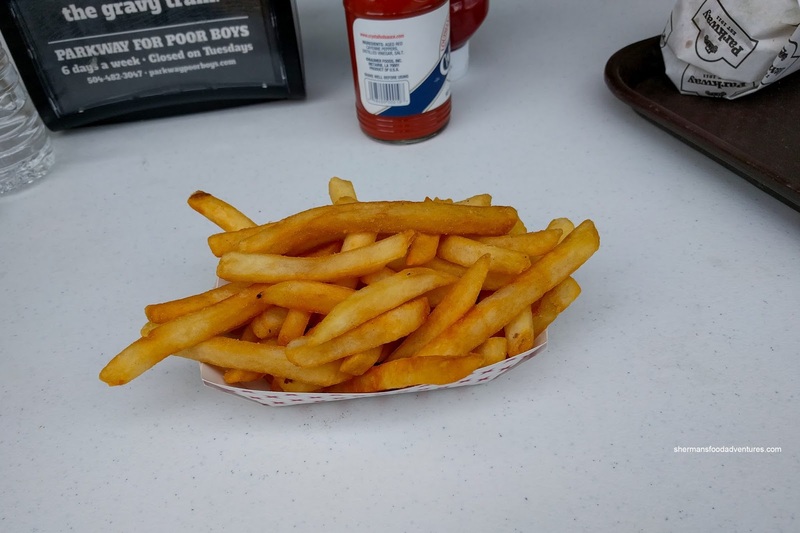 Crispy and in a medium size, the fries retained plenty of potato texture inside. Most, if not all were uniforming crunchy on the outside. They weren't overly oil and were lightly salted. 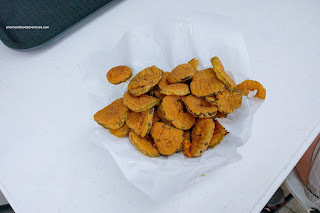 The deep fried pickle slices were also quite good. The breading was the same as the shrimp and was crunchy with plenty of flavor on its own. Although this didn't look like a tremendous amount of food for 2 people, we didn't finish. Maybe it was all the days of eating prior or possibly it was just too much food. 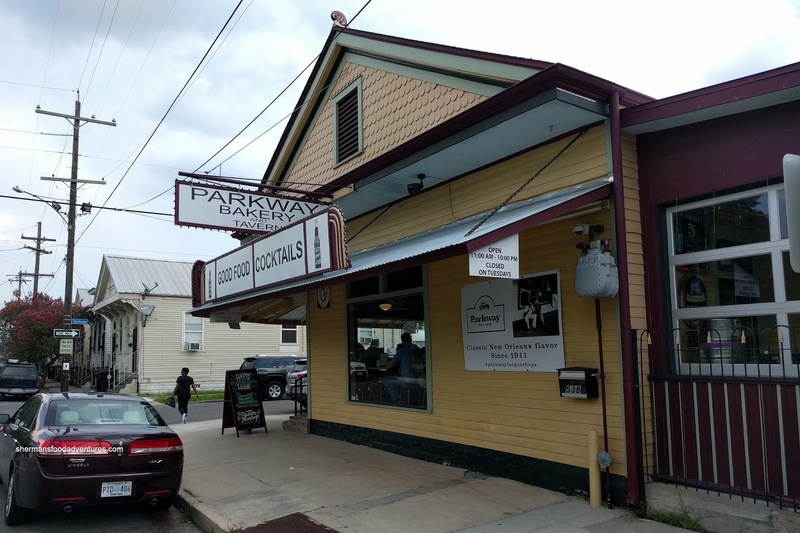 Whatever the case, Parkway does the po' boy justice and not for a lot of money either.